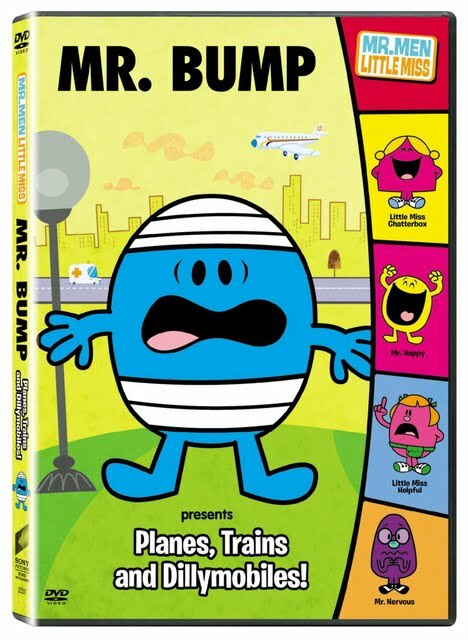 Film Intuition: Review Database: TV on DVD Review: The Mr. Men Show -- Mr. Bump Presents Planes, Trains and Dillymobiles! TV on DVD Review: The Mr. Men Show -- Mr. Bump Presents Planes, Trains and Dillymobiles! With the retro music, neon bright colors, mini-skits and dance breaks between the Abbott and Costello like riffs between Mr. Grumpy and Mr. Scatterbrain, at first glance, Eryk Casemiro and Kate Boutilier’s Emmy Award nominated Mr. Men Show feels like an animated update of Rowan and Martin’s Laugh-In. Using Roger Hargreaves bestselling collection of books about brightly colored characters who embody a certain personality trait (Mr. Happy, Little Miss Whoops, Mr. Nervous etc.) as fodder for this delightful series that airs on the Cartoon Network here in the United States, Casemiro and Boutilier were able to employ the lessons learned working for Nickelodeon’s popular shows Rugrats and The Wild Thornberrys to outstanding effect as one can witness in this infectious six episode DVD.